One of the most impressive things in the trailer of Thugs Of Hindostan was its stunning action sequences. 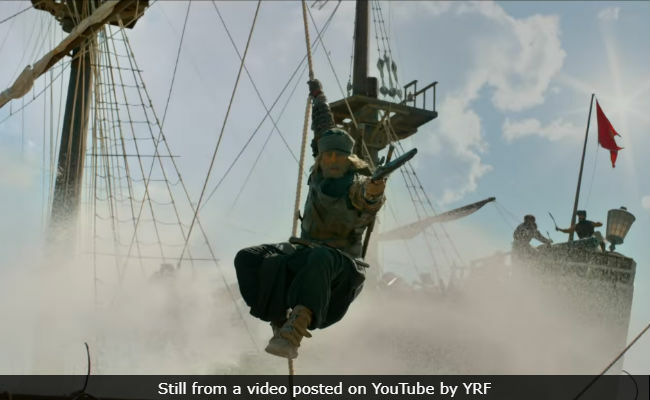 Three-fourth of the film's primary cast - Amitabh Bachchan, Aamir Khan and Fatima Sana Shaikh - performed pretty awesome stunts and a BTS video shared by Yash Raj Films depicts that it was not a piece of cake. "There is a lot of action, whether it is jumping off a building, doing summersaults, diving, climbing up. These were all done live," Mr Bachchan, 76, said in the video. In fact, the fight sequences and the heavy costumes also took a toll on Big B's health such that the actor had to suspend an outdoor schedule mid-way while filming last year. However, in the trailer, Mr Bachchan sprints and fights with the agility of a young man. "If you have committed yourself to a project then I guess you have to put aside all apprehensions and challenges and do what has been asked," he said in the video. Meanwhile, Aamir Khan and Fatima Sana Shaikh did not get an easy deal. "Just before I did Thugs of Hindostan, I did Dangal. Two of us (Fatima and Aamir) were training for a year and half in wrestling, and in wrestling, the stance is very low. You bend at the waist and you stand as low as possible. So instinctively, I use to stand low, so they had to try and get that out of me." Fatima is presented as an ace archer in the film and she had challenges of her own - she shows her bruised arm as proof. Action director Lee Whittaker, who has worked in Indian films such as the Baahubali series and Vishwaroopam 2, said that the actors had very short time span to learn the action choreography. "Most of our actors get three months of training... you known for john Wick and Matrix. We only had three weeks to train here in Mumbai on our makeshift ship and then we'd flew to Malta for another two weeks of training." "Thankfully, the actors in India already have a skill set when it comes to fighting. So, it's been really good and handy that AK (Aamir Khan) and Fatima (Fatima Sana Shaikh) already have that kind of foundation," he added. Thugs Of Hindostan, directed by Vijay Krishna Acharya, also stars Katrina Kaif. The film will open in theatres on November 8.